If you're in an AMAPCEO position, your union will represent you no matter what. While membership dues are deducted by your employer from your pay, you are not automatically a signed member of AMAPCEO. Under our Constitution, we distinguish between being a member of your bargaining unit (which is compulsory—see our note on the Rand Formula below), and active, signed membership in our union, which is voluntary. Signed members have the opportunity to vote in elections, serve as a representative, run for a leadership position, or participate in union training. You can even save big through discounts on products and services through our affinity program ServicePlus. AMAPCEO is pleased to provide three kinds of memberships. 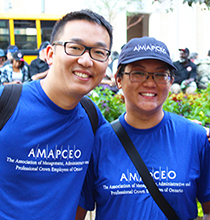 In addition to representing professionals who have a home position in an AMAPCEO bargaining unit, we also offer Associate and Retiree memberships. Find out more about each of these below. If you have a home position in one of the eight bargaining units (workplaces) that AMAPCEO represents, either as a permanent employee or as a contract / fixed-term employee, we encourage you to join the union and become an active member in good standing. In order to ensure that you receive all of our information and can participate fully in the organization (including voting or being a candidate in elections, being trained as a representative, sitting on a committee or participating in membership surveys), you must sign a membership form and become a member-in-good-standing. The process is as simple as completing our online application form. There is no additional fee to join. As indicated above, membership dues are collected, however, from all employees in the bargaining unit. AMAPCEO has an obligation to represent everyone, whether they are an active, signed member or not. Everyone who is represented by AMAPCEO receives the full protection of their collective agreement and equal access to our professional staff, legal counsel and other resources to defend their rights. Current membership dues, as authorized by the Delegates' Conference, are set at one (1.0) per cent of gross compensation, one of the lowest rates among unions in this province. AMAPCEO has a very high sign-up rate (well over 80%), which we interpret as a strong vote of confidence from the membership in their bargaining agent. The number of signed-up members also determines the number of delegates that your District is entitled to elect to our annual convention (the Annual Delegates' Conference), so there is an additional incentive to become a member to ensure that you and your colleagues have a strong voice in union decision-making. Another important benefit available only to signed union members is participation in ServicePlus, our exclusive membership services affinity and discount program, offered in partnership with one of our federal counterpart unions, the Professional Institute of the Public Service of Canada (PIPSC). Under the union's Constitution, employees whose permanent or home position is outside of an AMAPCEO bargaining unit, but who are temporarily acting in an AMAPCEO position, are entitled to a limited number of membership rights, once an associate membership form is signed. Associate membership entitles you to attend and speak at meetings of your District and access the website and receive information about AMAPCEO. Associate Members are not, however, eligible to become members-in-good-standing (and thus are not eligible to vote or otherwise participate in the governance of the organization). Seconded or acting employees in the bargaining unit are required to pay dues to AMAPCEO because they are entitled to representation and protection under provisions of the collective agreement during their employment. We encourage you, however, to become an associate member, which entitles you to be notified of all District meetings and receive all communications sent to members-in-good-standing. Associate members are also entitled to participate in ServicePlus, our exclusive membership services affinity and discount program. Taking out Associate Membership is also a vote of confidence in your bargaining agent and its role in protecting your working conditions. If you subsequently are appointed to a home position in AMAPCEO, your associate membership is automatically changed to full membership, with no need to re-apply. We encourage AMAPCEO-represented employees who retire to take out a membership as a Retired Member. The cost of retiree membership is a one-time fee of $25, which should be sent in by cheque or money order payable to AMAPCEO after you fill out the online membership form. 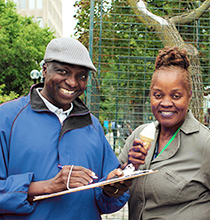 Retired members are entitled to continue their participation in ServicePlus and to continue receiving membership newsletters. They are also eligible to participate in the Retiree Caucus, described more fully in By-law 5, and to elect a retiree delegate to attend and participate in the Annual Delegates' Conference and the AMAPCEO Activists and Leaders Forum. A retired member is also typically appointed as a liaison on the Board's Pensions and Benefits Committee. AMAPCEO views retired members as an important resource to the organization - a source of expertise, support and advocacy for the value of public services in our society, the contributions of public servants and the need to protect and strengthen pension plans. Only members have the privilege to vote in AMAPCEO elections or run for a leadership position. If you don’t become a member, it’s like paying taxes and not registering to vote for your elected officials. The password-protected members’ area on our website has additional information, including details about your Collective Agreement, upcoming events, District news and bargaining updates. This is an important secure area tailored just for you. There are times when it doesn’t make sense to share certain information about negotiations with the employer and/or general public. Don't miss out on updates. Electronic newsletters and updates are only sent to members who provide their personal contact information. Work emails are not used. For every 50 signed members, a District is entitled to send one delegate to AMAPCEO’s Annual Delegates’ Conference; this is the highest decision-making body. Only signed AMAPCEO members can take advantage of ServicePlus, which offers preferential rates and savings on a range of consumer products, services and insurance. ServicePlus partners include: VIA Rail, Apple, Delta Hotels, AVIS, Rogers and Mark’s Work Wearhouse, to name a few. Only members can hold a volunteer position, a Committee role or become trained as a Workplace Representative or Health and Safety Rep. I consider it entirely equitable that all employees should be required to shoulder their portion of the burden of the expense of administering the law of their employment: the union contract. They must take the burden along with the benefit. The Rand rationale is not unlike the argument that all citizens must pay taxes, regardless of their personal convictions about the role or legitimacy of government or about which political party happens to be in office at any given time. The Rand Formula was adopted as part of our Voluntary Recognition Agreement that was negotiated with the OPS Employer in March 1995, making it possible for AMAPCEO to begin paying our lawyers, hiring staff, leasing office space and providing a broad range of representational services to members. If you are a signed member in good standing interested in learning how AMAPCEO spends your dues, you can find the annual operating budget and related information in the Delegates' section of the website, after logging in to your Homepage.